And what I actually need to be is a slow teacher. Ok, I'm going to back up - a couple of philosophies. Slow food is an international movement was born as an alternative to fast food. Slow food is all about knowing where your food comes from, preparing it with care, allowing the food to nourish our bodies and the meal to nourish our souls. A few days ago I came across this graphic. Carl Honoré is the champion of the slow parenting movement. He has written 3 books, In Praise of Slow, Under Pressure and The Slow Fix - all about slowing down in a fast world. 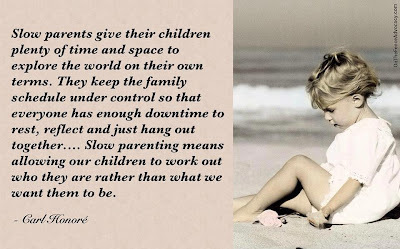 To me Slow Parenting is about bringing balance into the home. Children need to strive and struggle and stretch themselves but that does not mean childhood should be a race. It means letting things happen rather than jumping in and forcing them. It means accepting that the richest kinds of learning and experience often cannot be measured or neatly packaged. 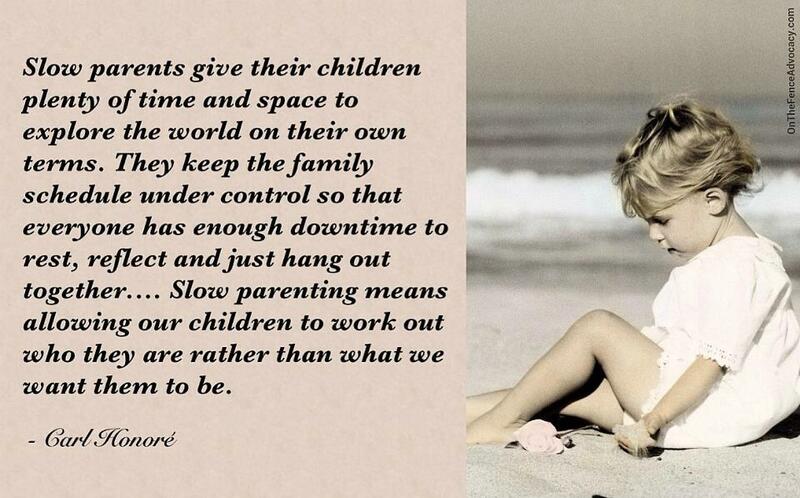 Slow parents understand that childrearing should not be a cross between a competitive sport and product-development. It is not a project; it’s a journey. It’s in those moments of quiet, of unstructured time, of boredom even, that kids learn how to look into themselves, how to think and be creative, how to socialize. We are doing a great disservice to our children by pushing them so hard to learn things earlier and earlier and by keeping them so busy. They need time and space to slow down, to play, to be children. Carl Honoré's 20 minute TED talk is time well invested. Last week, I was a slow learner. Not in the deep, meaningful learning kind of way. I forgot a lesson that I have learned and relearned time and time again. I put together a really cool activity that would require the kids to make connections and think in divergent ways. And it would be fun. Well, it would have been cool, and it would have been fun, if it had not been crammed into too little time. If we (well, if I) had taken the time to better engage the kids in the activity, if we had talked about our ideas, if I had allowed some thinking - idea percolation time, and then returned to the activity. Then it would have had a lot more meaning. A lot more learning would have taken place. And it would have been a lot more fun. I needed to quit rushing and slow down. Slow teaching does not seem to be a defined movement. But a number of educators are using the term to describe how they are, or want to, facilitate learning that is learner directed, authentic, deep, ethical, community-based, and joyful. 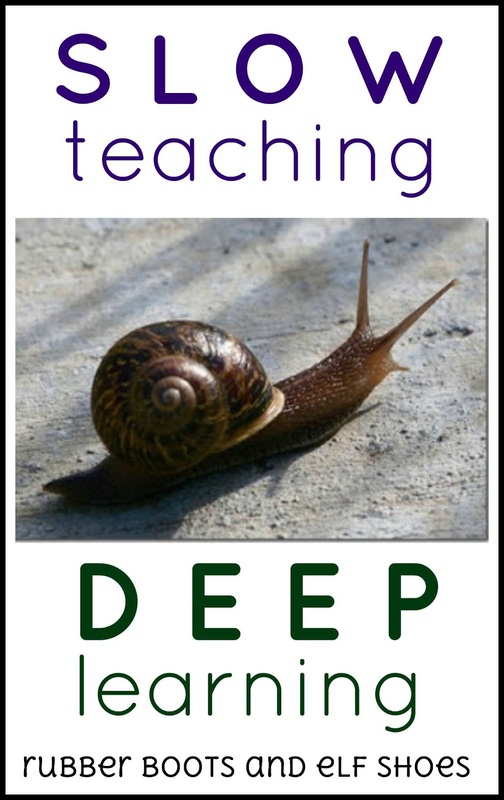 Brenda Dyck (EducationWorld) writes that slow teaching is the process of "uncovering" rather than covering the curriculum. I love that. 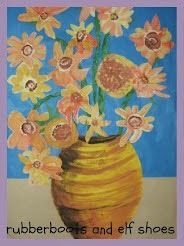 All thinks that take time and cannot be rushed if they are to be meaningful. I rushed our discovering, figuring out and creating time. Not to mention wait/processing time. Slow in this context does not mean doing everything at a snail’s pace. It means doing everything at the right speed. That implies quality over quantity; real and meaningful human connections; being present and in the moment. Sounds like Slow Teaching to Me. 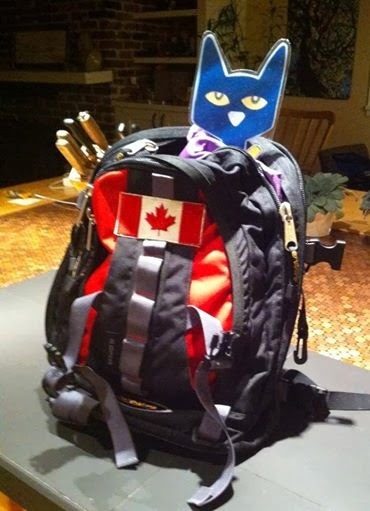 Just to show, that I am practicing being a slow teacher, I have been working on this blog post since Monday, and is now 4 minutes to midnight on Saturday night! I started out this year thinking slow, but as the year progressed, and the pressures to have my students at specific level with their reading and writing I forgot about being slow. And I forgot that no matter how fast I want to push them, we will be no farther ahead, we might even be farther behind. So, I face tomorrow with the mantra, "Slow down and breathe deep." 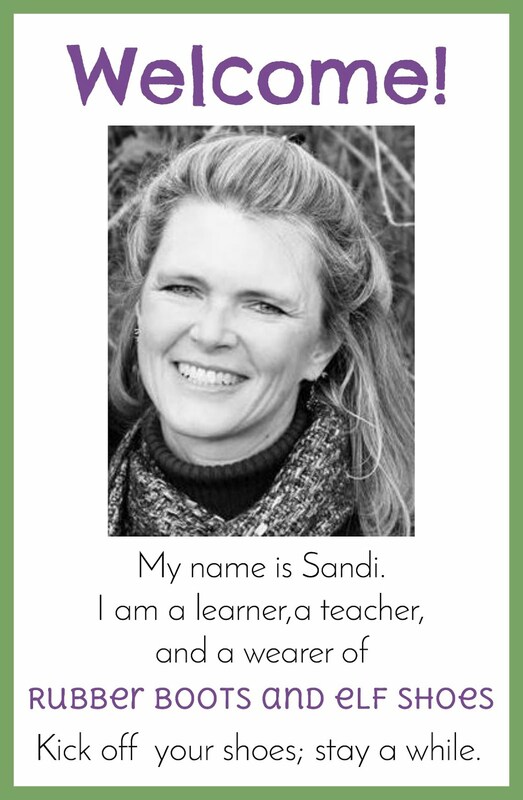 A FABULOUS post, Sandi. I love it. It really hits home for me. Perfect!! !This is so important to hear again especially at this time of year when our outdoors are so full of wonder. Such a great reminder. I was just feeling bad that I haven't gotten to some of my favorite lessons this year. I'm going to try to go back and decide if it was because we slowed down sometimes (in a really positive way) or because I spent time on things that maybe I should eliminate next year. I think it's probably a combination of both. I am so happy for the day spent exploring outside last week (although it does mean something else has to go). Great post! I was a slow parent and I'm an even slower grandparent, but some days at school I feel like I'm in the Grand Prix! I think I need to integrate more so I can slow down a little ... Actually a lot.